Sometimes the only thing to do, is to put the thing aside. All those months (years!?) that have passed since I sent my novel out haven’t gone wasted. At the time, an agent gave me some useful feedback. I agreed with her points and I understood clearly what was needed. But not how to do it. Nine months (or so) of unsuccessful redrafting later, I put it down. I went back to reading. I read and read and read. Anything. Everything. I took notes. I wrote short stories. And then, one novel had me turning pages as though it held all the answers. The writing is the best kind of dream. Samantha Harvey’s Dear Thief is a letter to an estranged friend, a woman who has betrayed the narrator. I kept thinking – my novel already had some questions, directly addressed to the reader. What if those were questions for the narrator’s sister? What if I wrote the entire novel to her? It’s early days, but I’m happier with it than I’ve been in a long while. 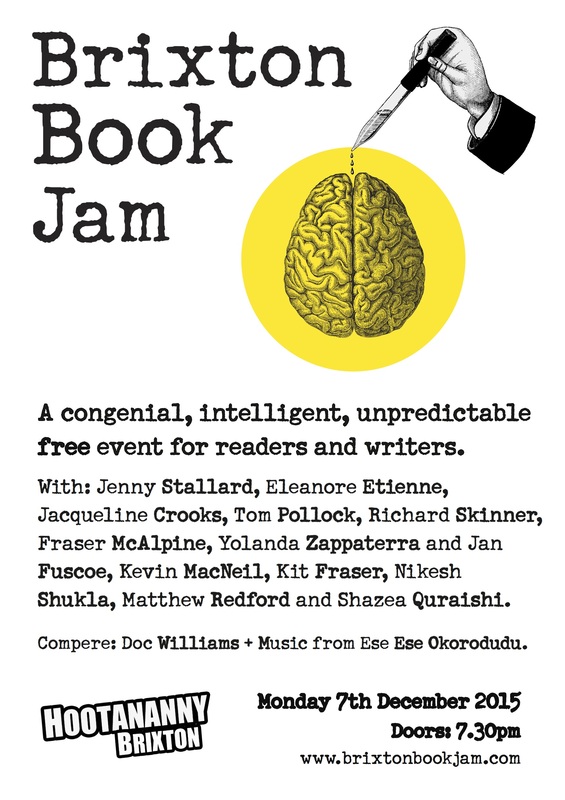 So, I’ll be reading a short extract from the current draft of The Exclusions of Love at Brixton BookJam. I’m sure I won’t know how I feel about this draft, until I hear it out loud in a room full of people. With thanks to Jacqueline Crooks and Richard Skinner, two fantastic writers I’m privileged to be reading alongside on the night. Sometimes it’s the tiniest thing someone says. When I was writing Summer, I asked friends if they knew about hunting practices that took place in Texas. One friend joked – snipe hunting. I liked the sound of it, even though I didn’t know what it meant. I looked it up. And it got me thinking. I’d been reading some non-fiction, books about growing older with positivity. I decided to write about a man getting older, and happier. No mid-life crisis here. I wanted him to have a gentleness – a sensuousness – contrary to his image as an ageing has-been. I wanted to have the young men around him, tease him (affectionately), display their young girlfriends like trophies they don’t realise he doesn’t want. I wanted him to finally be able to face up to the fears of his past, and to turn the trick around that the young men try to play on him. All because he’s older and wiser. I set it in Texas too, as a twin story for Summer. The resulting story, Snipe Hunter was one of the winning stories, selected to be read by an actor at Liars’ League, a fantastic live lit event. It’s an exciting thing, having that first story submission accepted. But the most interesting part of the experience was seeing how the actor interpreted my story. I’m in the habit of reading my work aloud, both at readings, and in the process of writing. I write for my voice. I know where and how I want the emphasis, the pause, the pace. A reader isn’t to know that, of course. I can’t sit over the shoulder of anyone reading my stories, even if I wanted to. The clue has to be in the writing. The actor added an urgency and drama, which was exactly right for the event. He kept the audience’s attention throughout which was quite a feat considering the size of the crowd. His dress and manner brought the characters and the story to life. Still, it was like a strange kind of loss hearing my words read in a way I hadn’t imagined when writing. The distance between me and my story was sudden. It was my first time. I hadn’t known to expect it. I felt silly and over-dramatic. The lovely comments I received about my story made it better. Once your writing leaves your hands, it really isn’t yours any more. It goes on to have a life of its own. Send it away, because that is the point, after all. For Liars’ League submissions and themes, go here. This might not work for everyone but it certainly worked for me. I was introduced to James Webb Young’s A Technique for Producing Ideas by short story writer Adam Marek, at a workshop, for Spread the Word in October last year. It’s an advertising manual, but works just as well for writing stories. 1) Gather your materials – this is everything of interest to you, in whatever medium, as vast and varied as possible. A life’s work, in fact. 2) Seek a relationship, a combination, a connection between selected materials – try and try and try, until madness beckons. 3) Do something else – mundane or pleasurable. Have a rest from all that thinking. Let your unconscious mind get to work. 5) Working over the Idea – how does hold up to scrutiny? Adapt, evaluate, work and rework until it…works. The workshop was a fast track leap through these stages. We drew spider graphs linking everything we knew to the theme ‘Halloween’. We were encouraged to chose two separate ideas and start thinking about possible links. We were shown a series of photographs, told to write down any thoughts we had whilst viewing them. Then it was time for a break – in the form of a mathematical puzzle. Doing something else, all right. Then it was time to write, first to instruction (what does it look like, feel like, smell like, keep writing, don’t think) and then to music. Three songs were played, while we wrote freely, non-stop, whatever came to our pens. I was thinking of witches and spiders. The photograph was this one. I knew her. As sure as I knew myself. Her name was Summer. Billy Ray said Summer was a witch. 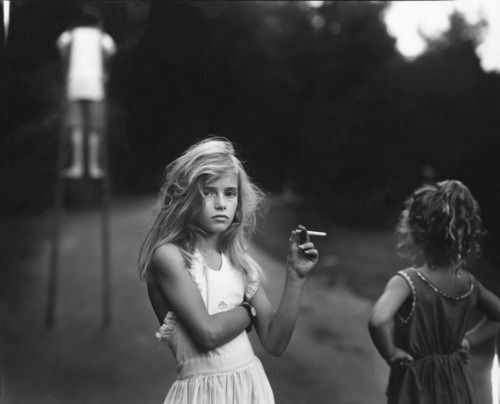 He said that because ever since she was nine, she knew how to blow smoke rings out of her nose. The two sentences I wrote as soon as I saw her. I wrote a piece for each of the songs played, but Cornflake Girl by Tori Amos showed me Summer dancing. By the end of the workshop, I had a slight story. I let it rest, sideways looking at, not really thinking about it, writing occasional notes, until I had it. I plan on using James Webb Young’s technique for a long time to come. It makes the madness easy. Summer can be read here. …I wasn’t aware of it. And it felt like madness. My first novel started with a dream. (A nightmare, actually.) When I dream, I dream vivid. A young boy in a hospital, terrorised by a fanged creature. He’s been put there by his parents, who believe the wounds on his arms and legs are self-harm. (In someone so young?) He tells them that it’s the creature doing it. No one believes him. Only the old vagrant, who sees the creature come to the boy every night, even whilst in hospital, knows. They won’t believe him either. I woke up sharp. My own voice repeating – the boy is me, the boy is me. How could that be? I’d seen no creature. My arms and legs were without harm. But, I knew it was true. Something haunted me. Had done for a while. No one else knew. He spoke to me, a voice in my head that wasn’t mine. He was older than I’d dreamt. I kept a notebook, wrote down everything he said, thought about him constantly, carried him with me always. The things he told me took me away from my dream and into his world. I gave him a name, Eliot. I began writing. I’d come home from work, pour wine while dinner got started and write. Eat. Then write, drink, write more. Every night that I was home. Conversations heard on the bus gave me dialogue, everything I read fed into my (his) story. I’d put on make-up and see Eliot’s friend, Angeline, in the mirror, kohled eyes (hers, not mine – I don’t do my eyes that way). Once I woke to feel Eliot lying on my bed, his shoes still on, hood up. Then I saw him, sat outside the tube station, still in that parka, hood up, watching the ground. I found my truth in his story. He wrote it, really. Not me. He seemed more real than I did. I tried to convince myself that I was ready to allow Eliot into my world, the way he had for me. I wrote the ending, when I had it. Eliot as an adult, still living with his past. Days later, I saw him. I walked past him at a bus stop. He put a hand out to touch me and said, ‘Hey lady!’ There are times when it’s perfectly valid to question your own sanity. If I hadn’t before, I did then. Yes, it felt like madness, alright. But I’m scared. How to rid myself of the fear? Do I first need to understand what it is that I’m afraid of? I don’t bother. I just start with the worst possible scenario – a room full of people, and me with a story to read. It’s a StorySLAM:Live event at the Southbank Centre. The theme is ‘Revolutions’. I write a short story taken from one of the main turning points in my novel, where it deviates from the Lysistrata theme, into an exploration of sexual freedom (rather than sexual strikedom). My ‘revolution’ will be a sexual revolution. I don’t realise, until I get there, that the five minute brief is not a guideline. There is a stop clock on the screen to the side of the mic. If I’m chosen to read, I’ll stand there in that spotlight. And I’d better read fast. I already know my story is closer to six minutes. I am chosen to read. My voice shakes for the full five minutes (and some seconds. Yes, I did run over…) but I get through it. And when I’m done, I listen to the feedback from the panel of judges (Yes, there were judges…) and it’s an incredible experience. One of the judges recognises the Lysistrata theme. (I take this as a positive.) Another judge has questions, for example, why don’t the women just go home if they miss their men? (This is answered in the novel, but how to say so much in five minutes? Am I trying to say too much for a short story?) The last judge says he likes stories that leave more questions than answers, and that I’m brave for tackling ideas of sexuality, gender and power. It’s exactly my (character’s) take on those ideas that I’ve been scared of sharing. I don’t feel brave. I feel as though I’ve just ‘flashed’ the entire world. But it’s alright. The fear just is. Stand up and read anyway. …don’t you get what you always got? I could just write another novel. I could redraft (and redraft, and redraft…) it. Workshop it. Send it out. Collect a couple of rejections. Put it in a drawer. Start on another. I’ve done it before. My first novel got a little attention. It’s the story of a teenage boy who believes he has a direct connection to God. One morning, he wakes to find his mother is missing and he gradually recalls his involvement in her disappearance. Two agents liked the beginning and asked to see more. When each, in turn, decided not to take it on, I felt wounded. But far down, miles under the sorrow, I was secretly relieved. I’d written by telepathy, hearing the protagonist’s voice in my head, even seeing him twice in the street. (More about that later…) I lived in his colourful, mythical world. Then he took me to a very dark place and back again. The experience left me spent. It was a truth. A truth that related directly to me. My self. I wasn’t ready to reveal myself, my self. I’d put too many layers of ‘normal’ on top of ‘odd’ to begin peeling them away. I got the idea for my second novel – a dystopian setting, a group of revolutionary women and more than a nod to Lysistrata, Aristophanes’ play. I laughed. I could already hear my new protagonist’s voice talking right to me. Odd wasn’t going anywhere. I had to admit that odd just happens to be my thing. It might not be anybody else’s. That’s fine too. I don’t just enjoy writing, I need it. This time, my story will have a life out in the world. I’m not giving up. I’m ready. I confessed that I had a burning desire to be excellent, but no faith that I could be. Martha said to me, very quietly: “There is a vitality, a life force, an energy, a quickening that is translated through you into action, and because there is only one of you in all of time, this expression is unique. And if you block it, it will never exist through any other medium and it will be lost. The world will not have it. It is not your business to determine how good it is nor how valuable nor how it compares with other expressions. It is your business to keep it yours clearly and directly, to keep the channel open. You do not even have to believe in yourself or your work. You have to keep yourself open and aware to the urges that motivate you. Keep the channel open. … No artist is pleased. [There is] no satisfaction whatever at any time. There is only a queer divine dissatisfaction, a blessed unrest that keeps us marching and makes us more alive than the others. – de Mille, Agnes (1991) Martha: The Life and Work of Martha Graham.